1 Why Do You Need Diving Gloves? 3 How to Care for Your Diving Gloves? I knew a guy who was diving down in Malaysia and hurt his hand badly. He was too busy looking at the marine life that he ran into a section of the reef. He wasn’t wearing any gloves and the gash ended up being so bad that he needed stitches. That’s why it’s critical to dive with a quality set of gloves! 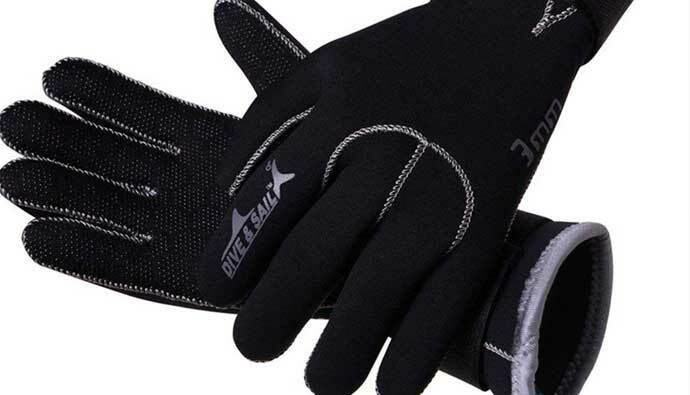 The best dive gloves will protect you from the cold and the environment. Dive gloves come in a variety of sizes and shapes. Most of them are 5 finger gloves, but some come in weird designs. The weirdest being dive mitts which are used by cold water divers since they provide a better thermal protection. Dive gloves are made from neoprene or other materials such as Kevlar, which are resistant to punctures and slicing. You may think that all gloves are the same, but in doing the research, there is actually quite a bit of info typically not shared. By the end of this article, you’ll be a glove master and will know the perfect ones for your next dive. Let’s dive into the world of gloves! Why Do You Need Diving Gloves? Dive gloves serve multiple roles including providing you with thermal protection and protecting you from sharp objects. Most dive gloves will provide a moderate amount of physical protection against minor cuts and piercings. Accidents happen all the time with divers who don’t wear gloves. 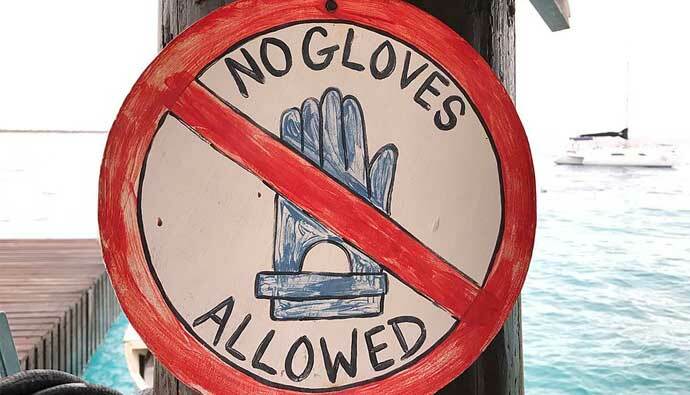 It’s not advised to dive without gloves even if your dive instructor tells you it’s ok not too. Spearos have other things to worry about outside of rocks and reefs. You can cut yourself touching the spines of lobsters or the gills of fish. If you’re spearfishing, opt for some kevlar gloves for extra protection over the standard neoprene. Another important role that gloves have is to provide you with thermal protection. Gloves come in different thicknesses and the thicker they are the better thermal protection they provide. Usually, when you go in colder waters it is recommended that you wear gloves at least 5mm in thickness. Gloves also provide added grip in the water. This is especially important when you are getting in and out of a boat. In some countries, there are no rules that tell you to wear or not gloves. Usually, those rules are meant to discourage people from touching the reef. Although those rules do not tell you to wear gloves, I’d still recommend wearing them. It is better to have some protection than to have none. You may never know when the unexpected is prone to happen. Hide the gloves in your BCD or wetsuit and pull them out if you need them. 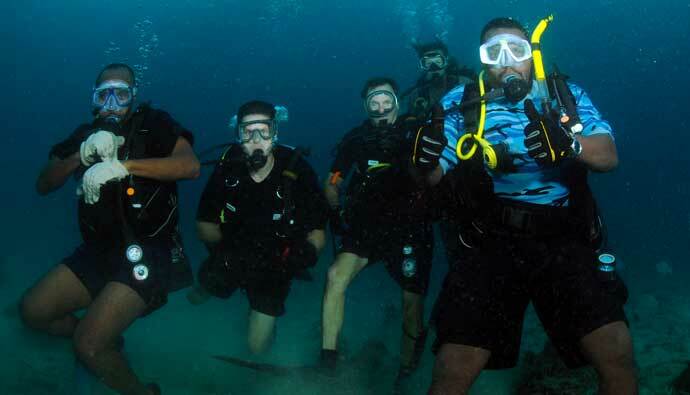 Usually, when you go diving in warm waters you’d be in locations like the Mediterranean or Florida. Most warm water gloves are made from 3 mm neoprene. Neoprene is a material used in making diving equipment and it is a type of rubber. It helps keep your hands warm but it is not that resistant when it comes to deep cuts, like knife cuts. But that doesn’t mean that it doesn’t provide a layer of physical protection. Warm water gloves come with a fastener that is most-likely a velcro strap to keep it secure to your hand. Those gloves can get sloppy when water infiltrates them and you have to keep them tight on your hand in order not to lose them. You need to make sure that the gloves are snug on your fingers and that you put them all the way down to your webbing. The warm water gloves are usually referred to as reef gloves. They are used a lot by scuba divers. Those gloves have a layer of leather or rubber on the palm for a better grip. When diving in colder waters you need to have more appropriate gloves. Cold water gloves are thicker than the warm water ones. Cold water gloves are made from 5 mm neoprene. Those gloves will provide better thermal protection and they also offer better physical protection because of their thickness. Other than being thicker, they are the same as warm water gloves. They have a surface on the palm that allows you to have a better grip of the objects around you, surface usually made of leather or rubber. Since they are thicker, they don’t require a velcro enclosure because the wetsuit will make a tight seal around the glove. This way the glove will be a bit hard to take off with a wetsuit. Hypothermia is a medical emergency that occurs when your body loses heat faster than it can produce heat, causing a dangerously low body temperature. Normal body temperature is around 98.6 F. Hypothermia occurs as your body temperature falls below 95 F.
When your body temperature drops, your heart, nervous system and other organs can’t work normally. Left untreated, hypothermia can eventually lead to complete failure of your heart and respiratory system and eventually to death. Hypothermia can be prevented by wearing an appropriate diving suit. Most heat is lost from the extremities of the body (hands and feet). Wearing thick dive gloves, 5 mm neoprene, will be enough to prevent you from losing heat in a rapid manner. Kevlar dive gloves offer you the ultimate protection. By wearing those gloves you are free to touch almost anything from the environment around you. Kevlar is a material used in bulletproof vests and it is very resistant to cuts and piercing. Loss of movement or manual dexterity, due to cold hands, can be dangerous during a dive, as well as being uncomfortable for the diver. 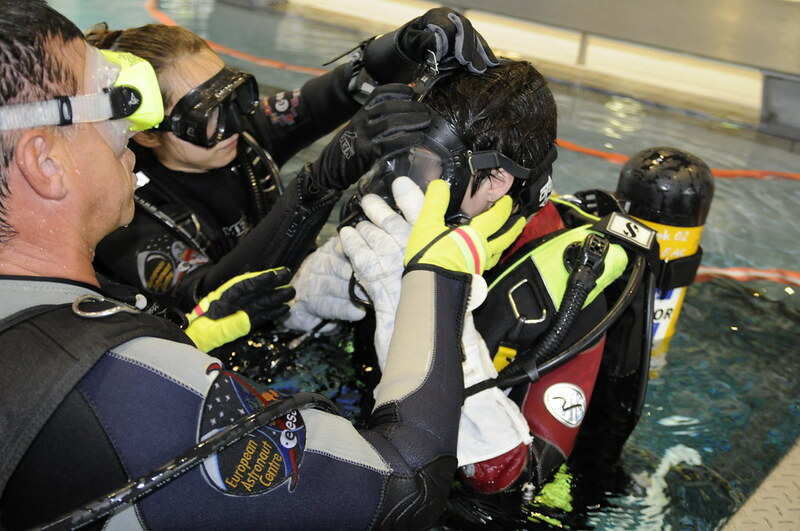 Maintaining hand warmth and a divers ability to efficiently operate their essential diving equipment, is vital to safe diving and maintaining a high level of dive comfort. Dry gloves have a wrist seal that seals the suit against your body. You can use dry gloves with regular diving gloves. You can put your normal dive gloves on and on top of them, you can put a waterproof tight glove and then tighten the o-ring seal. This will allow for a better thermal protection in cold waters. How to Care for Your Diving Gloves? With proper care, your dive gloves will last a long time! When it comes to taking care of your dive gloves, the process is simple. 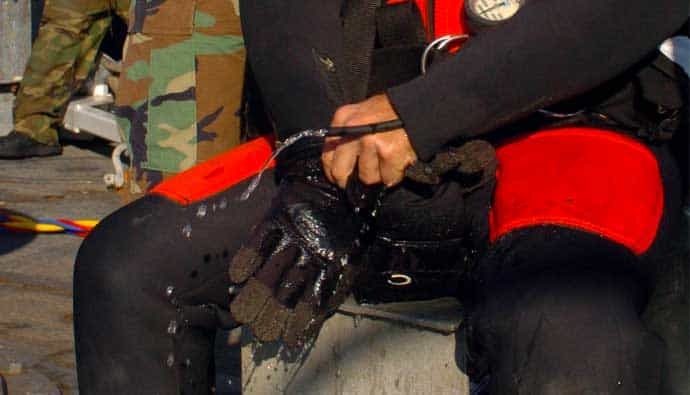 After every dive you have, you should always rinse your gloves in clean fresh water to remove any salt that is on them. Salt can damage the materials the glove is made of. Some divers prefer to use some washing substances to clean their gloves. This is not a bad thing to do, but you need to make sure that the substances you are using are not harmful to the rubber. You need to make sure that they will not dry the rubber that much so that cracks can start to form in it. Last but not least, you need to make sure to protect your dive gloves, as well as any other diving equipment away from direct sunlight and avoid keeping them in a car or in any other place that tends to get hot very fast. This way you will prevent the rubber from degrading and your equipment will last way longer. What temperature of water are you going to be in? Choosing the right type of dive glove can depend a lot on the water you are going to dive in. Warm waters requires thinner gloves, while, colder water will require thicker gloves and even mitts. Thermal protection is essential for every diver, hypothermia can be once of greatest enemies for someone that is going underwater. If you are going to dive in warm waters, 3 – 4 mm gloves are the best choice. They will provide a small level of thermal protection. If you are going to dive in cold waters, choosing gloves that are 5 mm or thicker is essential. The thicker the glove the better thermal protection it provides. Depending on what you want to do while diving, you need to choose the appropriate gloves for the job. If you are only looking for exploration, without interacting with the marine environment, choosing the appropriate type of gloves for the type of water you a diving in without any extra physical protection is ok. 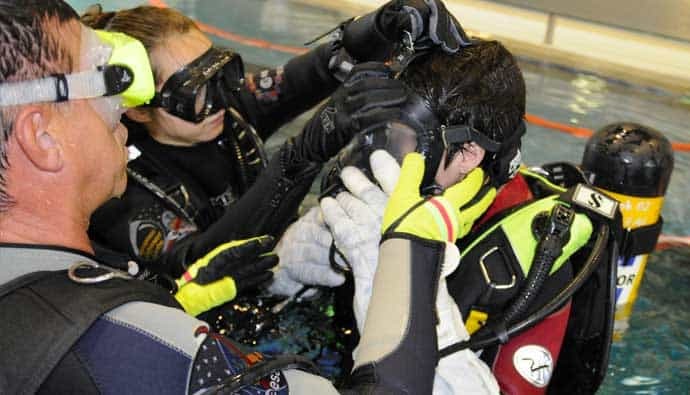 If you are going spearfishing or even in a more advanced exploration adventure where you decide to interact with the world around you (exploring a shipwreck or a coral reef) you need to have some sort of physical protection with you. Touching the fish gills or any sharp object can result in a cut. Having gloves that provide you with a good amount of physical protection are mandatory for those type of dives. If you are at risk for puncturing or cutting your hands, opt for kevlar dive gloves. Do you need a wrist strap? Wrist straps are usually used for gloves that are made for warm water. They are thinner and require some extra pieces to be held on to your wrist. Thicker gloves do not require those because they are kept on by your wetsuit. Wrist straps are usually made from velcro. Sometimes velcro can damage the glove, especially the palm side of the glove by scratching the rubber and by so affecting the grip. Does the glove fit snug but not too tight? Gloves need to be comfortable to wear. They need to fit well on your hand and not to slide off when there is a bit of water between your skin and the glove. 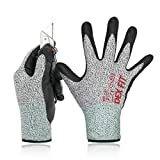 You need to choose gloves that are fit to your hand. They have to be able to be put on and to come off easily without any effort. Trying to force them on or off can cause them to tear. Is the made from quality materials? Having your diving equipment made from quality materials is essential. You don’t want your gloves to fail you while you are diving in cold waters. If your gloves tear and cold water enter them, you increase your risk of hypothermia. Choose your diving gloves by the build quality. Quality gloves tend to be a bit more expensive but are better to spend a buck now on a better piece of equipment than having to suffer later. The Tilos Mesh Reef Diving Gloves are great for warm water divers and snorkelers who can afford to sacrifice thermal protection for maximum dexterity. The reinforced Amara palms stand up against rocks, lobster, and other rough surfaces, while the velcro wrist closure comfortably keeps the Tilos Mesh Reef Gloves on tight. Excellent gloves in every aspect they provide a great dexterity under water. They are very easy to move, have a good tactile sense, and are very attractive. Plenty of dexterity to operate most things, and not hard to get on and off if you need to remove them in the water temporarily. The velcro clasps were very durable and held the gloves securely to my life vest straps when the gloves weren’t in use. They take a lot of time to dry. The material tends to wear out very fast if not taken proper care of. These gloves are a solid scuba dive glove meant for cold water. They will provide ample warmth and enough protection for most environments. These gloves provided protection from abrasion and sharp objects. They are fitted with tiny rubber dots to provide extra grip, which they do well. The fit is a bit tight when dry, but was very comfortable size fit in the water as they slightly expanded. As far as flexibility and feel, it’s almost as though you can’t tell you to have gloves on. Any excessive contact with Velcro (such as on BCD or wetsuits) will cause those rubber dots to come off, but don’t otherwise affect the use. They do retain a lot of water after a dive and will need to be wrung out prior to drying. The Dex Fit cut resistant gloves could help you to handle grater, knives, and mandoline with high protection and good dexterity, without worrying about hands injury. These gloves are designed to provide EN388 level 5 cut protection for your hands from blades cutting. 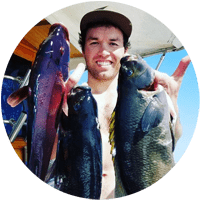 Those gloves are also perfect for spearfishing and will provide extra protection when it comes to cuts gained by grabbing fish gills or lobster spines. Those gloves provide you with great dexterity and sometimes you don’t even feel like you are wearing anything on your hands. The rubber that they have on the palm is great at providing extra grip. The material is very soft and also it is very resistant. They feel very comfortable while wearing and they can also be used with touchscreen devices without any problems. The material is strong and it is resistant to cuts, which is the sole purpose of those gloves. The BARE 7mm three-finger mitt are for those who love diving in cold waters and are looking for additional thermal protection. The three-finger design is perfect for that extra bit of warmth on cold dives keeping your fingers closer together to retain body temperature. These mitts are incredible when it comes to thermal protection. They are very thick and despite that, they are very comfortable to wear. They are durable and are able to withstand a lot of dives before starting to show signs of wear. They provide quite a bit of physical protection as well, despite that it isn’t their main role. They are also padded with some rubber on the palm for extra grip. If you’re using an attached glove with these your hands will stay warm and dry your entire dive. They are well worth it in cold water. They provide a good dexterity, no problem equalizing and warm. They feel very comfortable and the seal they provide is very strong, they do not let water get in.